From one of Britains most distinguished historians and the bestselling author of Hitler, this is the definitive history of a divided Europe, from the aftermath of the Second World War to the present.After the overwhelming horrors of the first half of the 20th century, described by Ian Kershaw in his previous book as having gone to Hell and back, the years from 1950 to 2017 brought peace and relative prosperity to most of Europe. Enormous economic improvements transformed the continent. The catastrophic era of the world wars receded into an ever more distant past, though its long shadow continued to shape mentalities. Europe was now a divided continent, living under the nuclear threat in a period intermittently fraught with anxiety. Europeans experienced a roller-coaster ride, both in the sense that they were flung through a series of events which threatened disaster, but also in that they were no longer in charge of their own destinies: for much of the period the USA and USSR effectively reduced Europeans to helpless figures whose fates were dictated to them by the Cold War. There were striking successes - the Soviet bloc melted away, dictatorships vanished and Germany was successfully reunited. But accelerating globalization brought new fragilities. 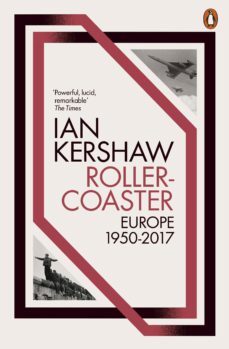 The impact of interlocking crises after 2008 was the clearest warning to Europeans that there was no guarantee of peace and stability.In this remarkable book, Ian Kershaw has created a grand panorama of the world we live in and where it came from. Drawing on examples from all across the continent, Roller-Coaster will make us all rethink Europe and what it means to be European.